There is a strange story behind this book. I read several things about it months ago and on a whim I purchased it as my next book to read. However, after finishing the book I was currently reading, when it came time to now read “Daniel”, I became convinced I was not going to like it. I passed over it and bought something else and then another and another while Daniel sat there patiently waiting for me to pick him. Finally, I felt sorry for him and decided to give him a try with very low expectations. Guess what? Daniel was a terrific read! It’s 1972 in the Central Highlands of Vietnam and the American resolve for fighting this war is waning. Troop pullouts have begun but Firebase Martha remains one of the few fighting units left in Nam. At 2:00 AM one morning, perimeter guards almost fire on a lone figure emerging from the jungle and making his way through the wires surrounding the base. 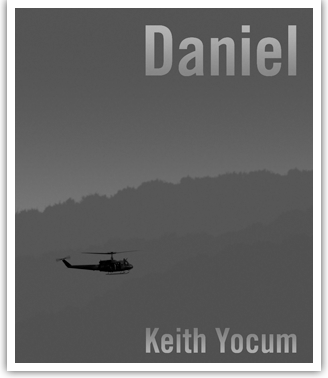 He turns out to be an American infantryman named Daniel Carson but he doesn’t know much more than his name. Further investigation reveals that a Daniel Carson, a soldier from a nearby platoon, was killed in action a week ago. Daniel doesn’t talk much but he seems to have an uncanny knack of knowing what the enemy is about to do. After a few incidents, even the top brass start paying attention. As the fighting intensifies at Firebase Martha it becomes apparent that Daniel may be their only chance of getting back home alive. This was one of those inexpensive ($2.99), self-published books but it turned out to be a great value. Keith Yokum has a real talent for building a story to a page turning climax. I can’t help but join all of the others who thoroughly enjoyed this tale of the puzzling stranger who came to play such an important part in the lives of his fellow soldiers. This one deserves each of the four **** stars I am giving it.